I've been quite vocal in regards to a real problem with some of our most typical insulation materials: that they're manufactured by using blowing agents that have highly concentrated greenhouse gases. Insulation materials help our houses save energy and, by doing this, they decrease the burning of fossil fuels and the release of greenhouse gases. 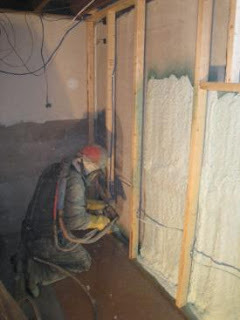 However, if the insulation material itself is made using a very-high-GWP blowing agent which could eventually escape from the insulation, adding a great deal of insulation might actually be a very bad thing from the viewpoint of mitigating climate change. All that was detailed in my article several years ago, "Avoiding the Global Warming Effects of Insulation" and, in depth, in the EBN feature write-up on the exact same topic. With XPS, the blowing agent HFC-134a has a GWP of 1,430, which means that it's 1,430 times as potent as carbon dioxide (that is defined as having a GWP of 1). Almost all closed-cell SPF is produced with the blowing agent HFC-245fa, which has a GWP of 1,030. Anyhow, given all of this, I've been closely following the breakthroughs by industry in developing alternatives which are neither ozone depleters nor considerable greenhouse gases. A couple of years ago, it appeared that the primary candidates were HFOs (hydrofluoroolefins), and Honeywell revealed the development of this sort of product in 2011. And also, it was just reported a couple weeks ago that Whirlpool, the nation's biggest home appliance company (with such brands as Maytag, Amana, Jenn-Air, and KitchenAid, as well as Whirlpool), was shifting to a different HFO blowing agent for the polyurethane insulation in all of its refrigerators. Whirlpool is going to be utilizing the new Solstice Liquid Blowing Agent created by Honeywell, one of the nation's 3 makers of blowing agents (as well as DuPont and Arkema). Solstice HFO has zero ozone depletion potential and a GWP of just 4.7 to 7.0-similar to that of the numerous hydrocarbon blowing agents found in expanded polystyrene and polyisocyanurate - and insignificant relative to global warming. Further more, Solstice HFO will increase the R-value of the insulation components just a little. Compared to HFC-245fa, this HFO yields insulation with 2% higher R-value, and in contrast to hydrocarbon blowing agents it provides an 8% to 10% enchancment, determined by Honeywell. While the improvement is fantastic, it's not instant. The HFO has recently received its approvals from the united states government, and this will require sometime to ramp up manufacturing and switch refrigerator manufacturers to the new foam. Whirlpool plans to get started on integrating the new blowing agents into its refrigerators in end of the 2013. But what about the closed-cell SPF insulation that's widely used to insulate buildings? Unlike in 2003 when federal rules required a change from HCFC to HFC blowing agents as a consequence of ozone depletion fears, there are no similar regulations demanding a switch from HFCs to HFOs. Plus the conversion process requires time and is also really expensive - about 12 months and a minimum of $100,000, says Duncan. With the building industry still in an market recession, companies aren't planning to invest a lot of extra money on product advancement. Duncan feels, however, that after a new life-cycle assessment (LCA) report on SPF is released that SPFA is now finalizing, consumers will start requesting for lower-GWP foam and manufacturers will answer by making it. From an environmental perspective, open-cell SPF (which doesn't contain HFC blowing agents) has just 1/20th the global warming effects of closed-cell SPF. Jan McKinnon, the senior communications director at Dow Building Solutions (manufacturer of Dow Styrofoam XPS), states that this company is seeking solutions to decrease its greenhouse gas pollution levels. "Since the kick off of our new formulation in 2010 [converting from HCFC-142b to HFC-134a], we keep looking at reducing our blowing agent global warming potential, and we have an proactive process in position to lower it by 15%," she informed me. She said that they are actively evaluating alternative blowing agents for XPS, "but a good number of of these technologies are still in their infancy." Each of the SPF and XPS markets already have experienced a couple of significant changes: from CFC to HCFC blowing agents and then from HCFC to HFC blowing agents. With a weakened constructing economy and depressed sales and profits of constructing supplies, excitement for a 3rd significant conversion has been very little. However I feel that you will see a increasing demand to make products with very little affect on global climate change as is possible - and in case this year's heat and drought continue on, that demand may possibly increase. It really true insulation can keep us warm and not warm the planet; it is an energy efficient technique. You have added here interesting and informative article about insulation. I want to say thanks for sharing this great post.